Searching for a pet-friendly hotel in Southern California? Look no further than West Hollywood. Home to 1,000 dogs per square mile, West Hollywood’s pet policies truly reflect the core values of the city. West Hollywood designed a law that pets are to be called “companions” and their owners “guardians,” and was the first city in the country to outlaw the de-clawing of cats. Retail sales of pets are outlawed, as is the sale of fur throughout the city of West Hollywood. 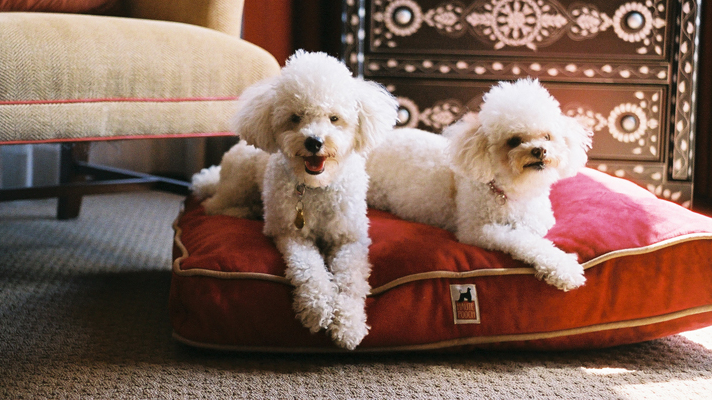 This sets the stage for many of West Hollywood’s hotels which are pet-welcoming. The London West Hollywood Hotel and The Sunset Tower Hotel offer various pet amenities such as doggy bowls, treats, beds, and can arrange for a dog walker. The London West Hollywood Hotel has a bulldog ‘mascot’ named Stella who makes appearances throughout the week. The Le Montrose Suite Hotel, The Sunset Marquis Hotel and Villas, Chamberlain West Hollywood, Grafton on Sunset, Le Parc Suites, Palihouse Holloway, The Standard, and Petit Ermitage are also pet friendly. Once settled, take your pet shopping and dining! In West Hollywood, you’ll often see people out walking and dining with their pets at outdoor cafes and coffee shops. Located around the city are several unique pet stores such as Healthy Spot or Collar & Leash. Around Santa Monica Boulevard are several dog washing services, animal hospitals, and curbside dog stations. During special events in the city, pets can get in on the action, too. The City of West Hollywood sponsors an animal walk and pet appreciation days throughout the year, which have in the past featured pet psychics and dog activities. During the week prior to Halloween, animals can participate in a doggie costume contest in West Hollywood Park. If you’d like to take your dog hiking, West Hollywood is in close proximity to Runyon Canyon hiking trail and dog park in Hollywood, a popular moderate workout through the Hollywood Hills with a view of the Hollywood Sign and a chance to take your dog off-leash and socialize with other Hollywood dogs out for a stroll. Content provided by the West Hollywood Marketing and Visitors Bureau. Click here to read more about pet-friendly West Hollywood.